The Netherlands is known for reclaiming land from the sea with impressive dikes and water management. About half of the country lies below sea level, some places by several feet. This makes it especially important to be able to measure the changing level of the sea. The Huddesteen are Holland’s earliest examples of this practice, dating back to 1684. The Huddesteen, or «Hudde’s stones,» were named after Johannes Hudde, a civil engineer who served as mayor of Amsterdam from 1672 to 1703. He commissioned eight large marble stones to be installed on sluices (locks) in the dike along the city’s IJ waterway. Lines etched in the stones marked the high water levels, which allowed builders to compare their dike and sluice heights to withstand the worst-case scenario of flooding. 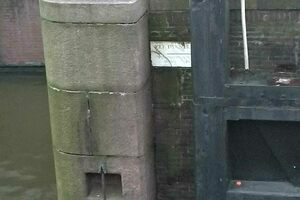 The markers formed the basis for the Amsterdam Ordnance Datum (Normaal Amsterdamse Peil), which is now used to measure water levels throughout Europe. Prussia adopted it in 1878, Luxembourg in 1973 and Sweden, Norway, and Finland after that. The Hudde stone found on the Eenhoornsluis («Unicorn lock») in Amsterdam is the only stone that is still located at its original location, untouched for nearly 350 years. Half of another stone can be found in the Amsterdam Ordnance Datum exhibit at the visitor center at City Hall. The remaining in situ Hudde stone stopped being used as a standard in 1867 because its deviation was deemed too large compared to the other measurement methods. However in 2007 it was measured again and added to the ordinance database.